An accident at a roundabout in Arundel is blocking the A27. A car and a motorcycle were involved in a collision at the junction of Torton Hill Road and Canada Road, near Arundel Baptist Church and the roundabout on the A27 near the River Arun, earlier this afternoon. 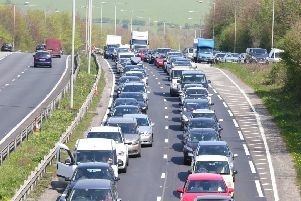 As a result, traffic is blocked on the A27 travelling westbound.